The first time I had ever cooked lamb, it was almost 1 year ago for the first ever blog post for Food Comas: Baby Lamb Chops with Cucumber-Mint Relish. Ahh the memories! I found this recipe from my trusty Ad Hoc at Home cookbook. 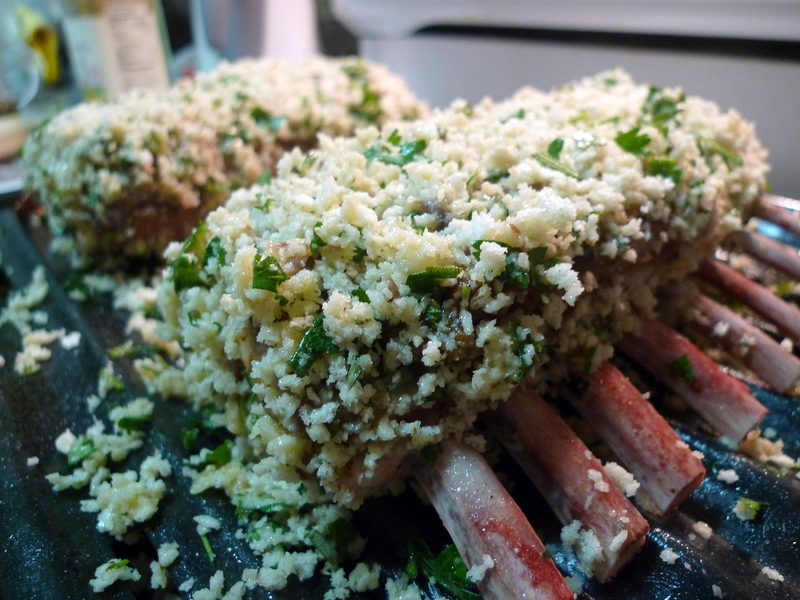 Thomas Keller coats the rack of lamb with buttered bread crumbs seasoned with anchovy, rosemary, and garlic. I thought the anchovies were a bit odd, but they really added a salty, savory depth, rather than a fishy taste. If you love anchovies, definitely add more to the mixture! 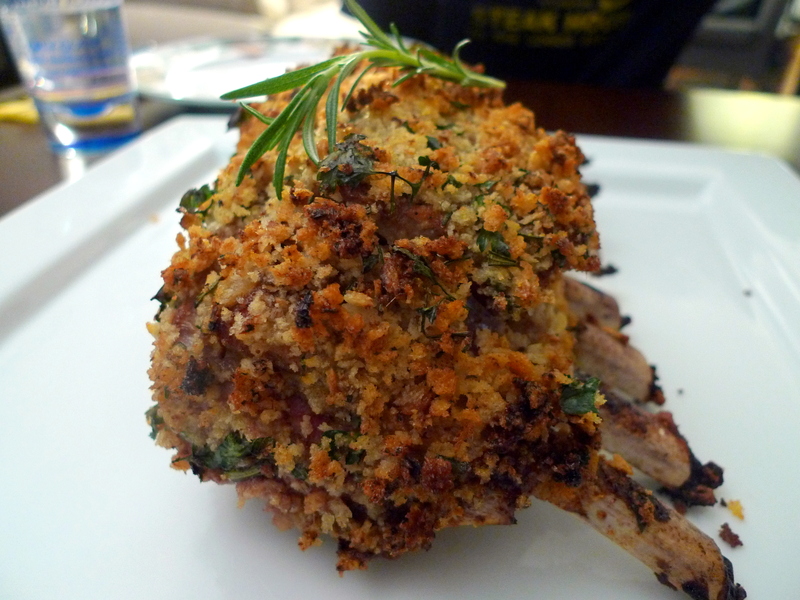 The racks can be seared and coated with the crumbs up to 6 hours ahead, then roasted when you are ready. Lamb is often associated with springtime, particularly with the traditional of eating lamb for Easter. Thus, most spring vegetables are a great complement to the slightly game-y taste of lamb, such as peas, carrots, asparagus, fennel, chard, artichokes, and so on. Mint is also a popular pairing with lamb and so I tried serving this with a refreshing Salad Shirazi, which is a traditional Persian salad of tomatoes, cucumber, onions, and mint (very similar to the salad I made last time with my Baby Lamb Chops with Cucumber-Mint Relish expect now I found the formal name!). 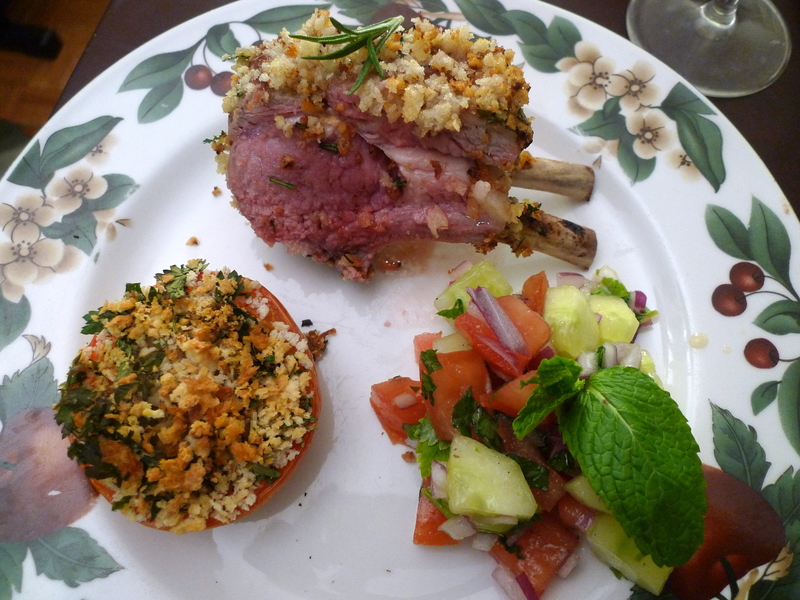 I also served these lamb chops with Provençal Roast Tomatoes, although perhaps it was too much in terms of bread crumbs. Caramelized Carrots, Potato Gratin, Braised Endive, and Roasted Asparagus are also great sides for this dish. 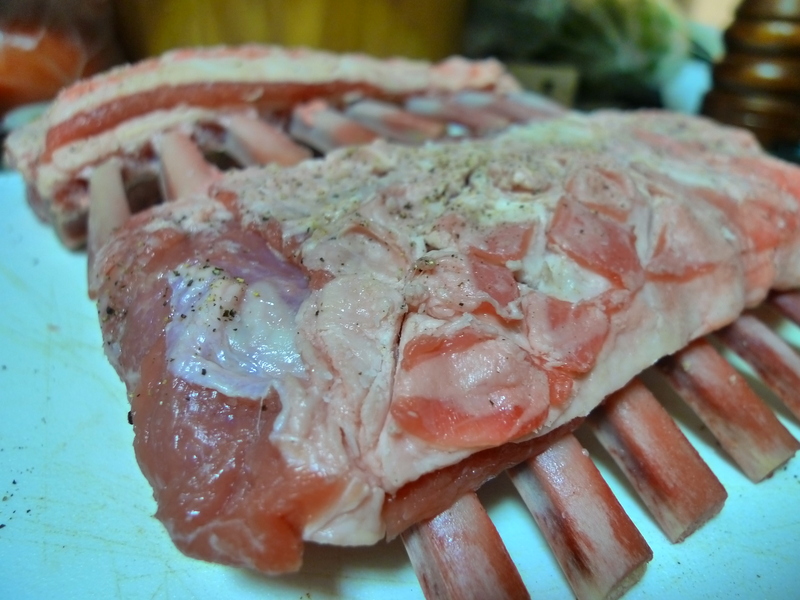 Score the fat covering the lamb in a cross-hatch pattern, taking care not to cut into the meat. Season the racks on all sides with salt and pepper. Set a roasting rack in a roasting pan. Heat some canola oil in a large frying pan over medium-high heat until it shimmers. Put one rack fat-side down in the pan and sear until golden brown, 1 1/2 to 2 minutes. Carefully move the lamb as it sears to brown as much of the fat as possible. 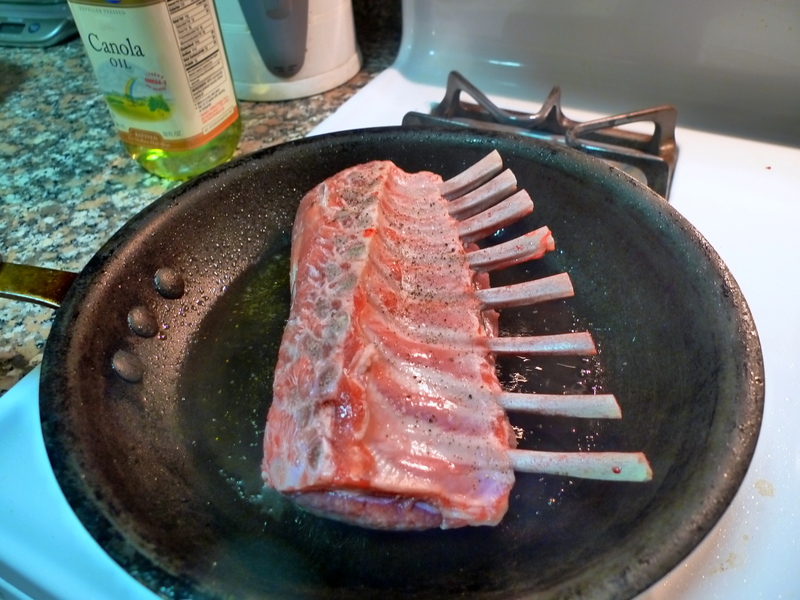 (It is best to sauté one rack at a time, so the temperature of the pan doesn’t drop dramatically.) Transfer the lamb to the roasting rack, meat side up. Drain the fat, and reheat the pan, adding fresh oil. Repeat with the remaining rack. 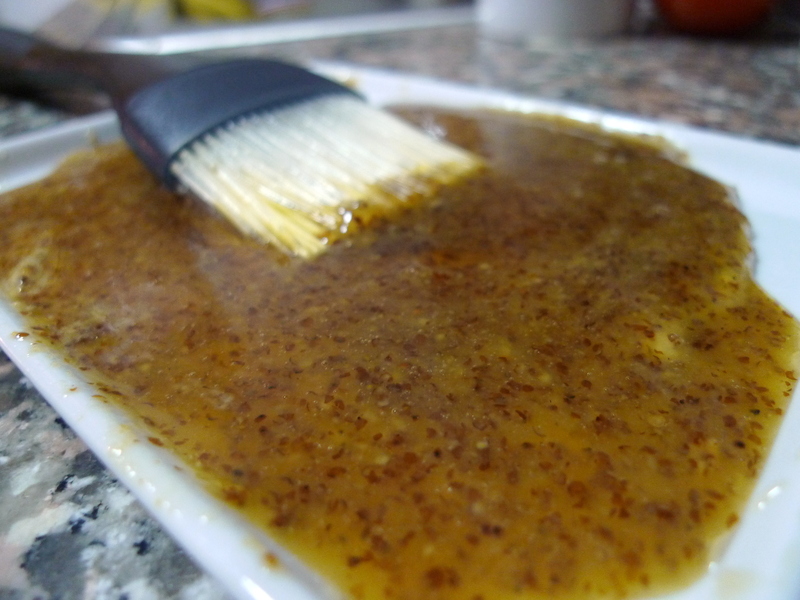 Combine the mustard and honey in a small bowl; set aside. Combine the butter, garlic confit and anchovies in a small food processor and puree until smooth. 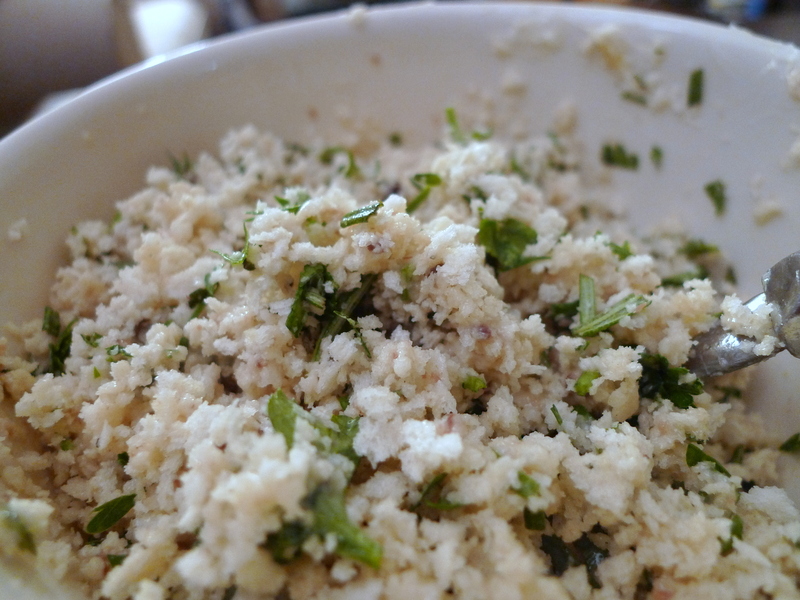 Transfer the puree to a medium bowl, and stir in the bread crumbs, parsley and rosemary to combine. Do not overmix; the mixture should be moist, but it may not all come together. 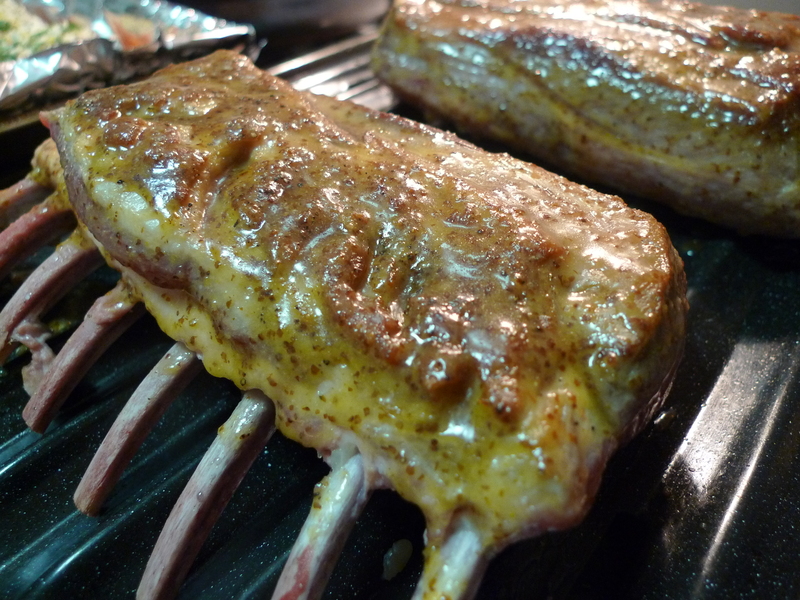 Brush the mustard mixture over the fat and meat, but do not coat the underside of the racks. Position the oven rack in the bottom third of the oven and preheat the oven to 425° F. Put the lamb in the oven, meat-side toward the back, and roast for 25 to 35 minutes, until the temperature in the center of the meat registers 128° F to 130° F. Let the racks rest on the rack in a warm place for 20 minutes for medium-rare. 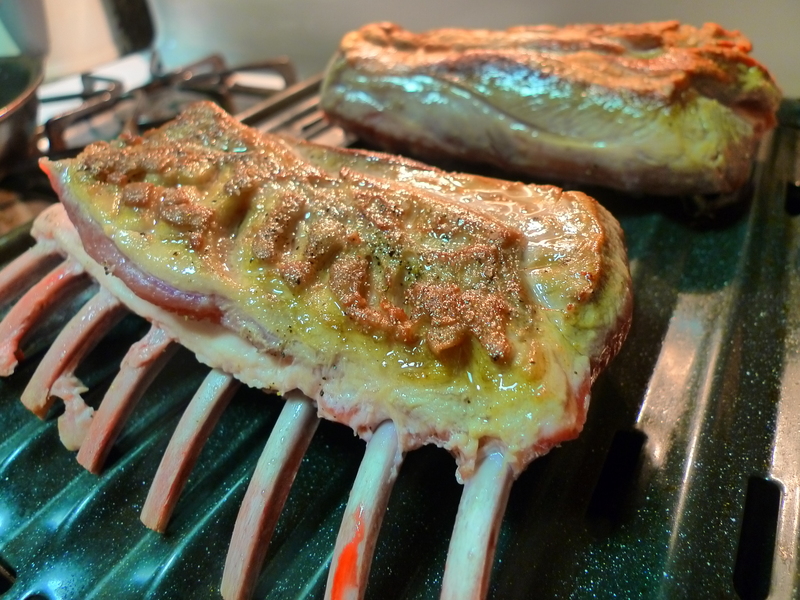 Carve each rack into four 2-bone chops, and arrange them on a platter. Sprinkle with gray salt or sea salt and serve.